Prior to joining CCM, Stirling Shelton spent ten years as technical director with the Cincinnati Playhouse in the Park. 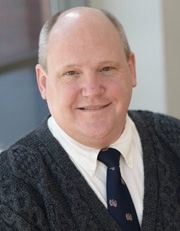 He also has served as technical director at the University of Missouri–Kansas City, Music Theatre of Wichita, Missouri Repertory Theatre, East Carolina Summer Theatre and Pennsylvania Center Stage. Among his numerous professional engagements, he served as production coordinator and lighting designer for Metropolitan Community College Playfest (Kansas City, Missouri), and as lighting designer for productions with Miami University, Johnson Community College, CCM and the University of Missouri–Kansas City. He also served as an adjunct professor at Penn State University. Shelton has received a Cincinnati Enquirer Acclaim Award, two Cincinnati Entertainment Awards and a Florida Player of the Year award, among others. BFA, University of Florida, Gainesville, FL. MFA, University of Missouri-Kansas City.